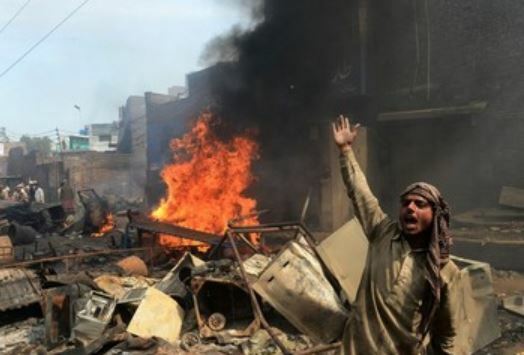 (March 9, 2013) LAHORE, Pakistan —After hearing accusations that a Christian man committed blasphemy against Islam’s prophet, over 3,000 Muslim protesters turned violent and destroyed a Christian neighborhood on Saturday by torching homes. Reports claim over 100 homes have been burned or vandalized. A large crowd from a nearby mosque went to the Christian’s home on Friday night, after a young Muslim man accused a Christian of committing blasphemy by making offensive comments about the prophet. Police took the Christian man into custody to try to calm down the crowd. Fearing for their safety, hundreds of Christian families fled the area overnight. Reports say the mob returned on Saturday and began setting the homes of Christians ablaze. Though no one in the Christian community was hurt, several policemen were injured when hit by stones as they tried to keep the crowd from rushing the area. 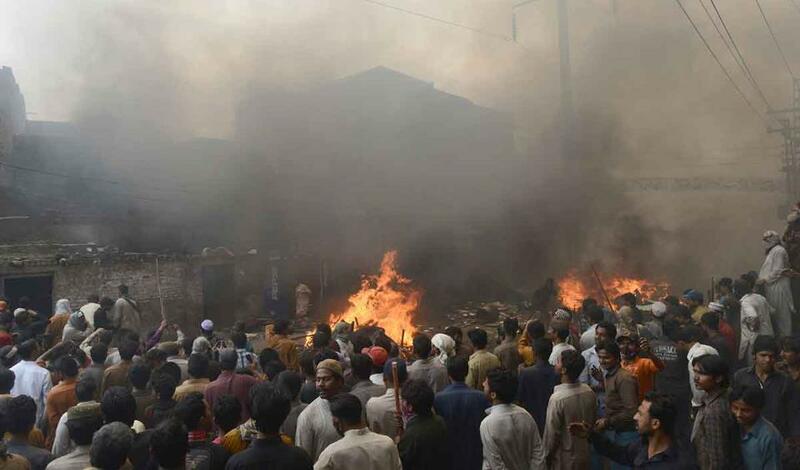 (AP) reports Akram Gill, a local bishop in the Lahore Christian community said the incident had more to do with personal enmity between two men than blasphemy. He said the men got into a brawl after drinking late one night, and in the morning the Muslim man made up the blasphemy story as payback. When they came to the neighborhood to investigate, the Christian community handed the accused man over to police. He is identified by police as Sawan Masih. Afterwards the Christians all locked up their houses and went to relatives in other areas. On Saturday morning, the mob was armed with hammers and steel rods and broke into houses, ransacked two churches and burned Bibles and crosses. Refrigerators, washing and sewing machines, cooking pots, beds and other household goods were ripped from homes, smashed and torched in the streets. A couple from the neighborhood went to their Muslim neighbors’ house on Friday night after people came looking for the Christian man accused of blasphemy. Ishaq Masih said the Muslim neighbors sheltered the couple for the night and then gave them money to leave the area in the morning. Accusations of blasphemy in Pakistan have prompted huge crowds to take the law into their own hands. Once an accusation is made it’s extremely difficult to get it reversed, partly because law enforcement officials do not want to be seen as being soft on blasphemers. Speaking out against the blasphemy laws can put people in danger. Two prominent politicians (Shahbaz Bhatti and Salman Taseer) were assassinated in 2011 for urging reform of the law. The killer of one of the politicians was hailed as a hero, and lawyers at his legal appearances showered him with rose petals. Last year there was a rare reversal of a blasphemy case. A teenage Christian girl, Rimsha Masih with suspected mental disabilities was accused of burning pages of the Quran. She was later released after a huge domestic and international outcry about her treatment. In a rare example of the accuser facing legal consequences, a local cleric was arrested and accused of planting the pages in her bag to incriminate her. He had hoped to rid the community of Christians. He has since been freed on bail. Though exonerated of all charges, unfortunately Rimsha and her family now live in hiding for fear of further attacks from death threats. While Muslims are frequently accused of blasphemy, members of Pakistan’s small Christian community are especially vulnerable to the accusations, said the head of the Human Rights Commission of Pakistan, Zora Yusuf. Only in Christian cases will violent mobs punish the entire community for the ‘perceived’ crime of one Christian. She also said that often these blasphemy cases are personal grudges or disputes masquerading as religious fervor. “Most of the time there are other motives involved,” she said, such as scaring off Christian residents to grab their property. Please remember Pakistani Christians and keep them in your prayers. Please also pray for those doing the persecuting! By VOICE OF THE PERSECUTED in Asia, Christian Persecution News, Pakistan on March 9, 2013 .